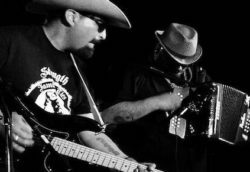 Formed in 2004, New Mexico’s Felix Y Los Gatos swims in a danceable musical stew of zydeco, Tex-Mex, blues, and Django Reinhardt-esque gypsy jazz. Founding members Felix Peralta (vocals, guitar) and D.B. Gomez (button accordion) came together by way of open mics in the Albuquerque University area. Peralta spent his childhood watching his family play traditional New Mexican rancheras. Likewise, Gomez, who grew up in Santa Fe, was exposed to traditional Southwest sounds and switched from piano to accordion once he started playing with Peralta. Long-time Drummer Melvin “The Honey” Crisp brings a Cajun/zydeco rhythm to the party. The band has played Telluride Blues Festival, Thirsty Ear Festival, Long Beach Crawdaddy Fest, BlissFest, and many others. They have shared the stage with the likes of Big Bad VooDoo Daddy, Tab Benoit, BeauSoleil, Ozomatli and FishBone, as well as contributing to John Popper’s (Blues Traveler) “Hot Damn” track.